Yes, that's San Pietro in Vincoli. Upon seeing this image, I am reminded of a dream which I had 20 years ago. It was similar to your picture with the bright light. My soul was pierced by these rays and I woke up immediately. I didn't know what the image was yet since I was a fallen away Catholic. But, something happened after this experience, I had this desire to learn to pray the rosary, and a desire to go to Mass as often as I could. I now realize after all these years to share this experience and tell everyone of God's mercy, especially when they are dying. I still carry this fire within my heart and feel very blessed to have experienced the dream I had. The image is identical to my dream with the fire, which I take to be God's Divine Love and Mercy. God Bless. Hey Michael, you made it on SpiritDaily today! That picture of the Divine Mercy is for sure in St.Peter in chains. I was there in 2003. 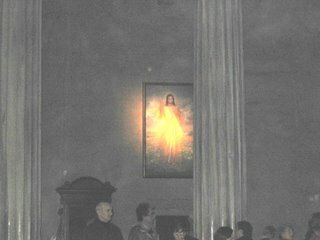 The picture is the the left if you are facing the apse. Hope this helps. PRAISE GOD..HE SURELY IS TRYING TO GET OUR ATTENTION! THANK YOU FOR SHARING. Wow! That is amazing, how glowing and appealing this image is. I truly believe that the divine mercy image is a miraculous one, because each time I pray or even look atv it, it gives me a great sense of inner peace, joy and comfort. God bless u.
I think Our Lord was sending you a message as well as anyone who views this post, that He is all forgiving if we believe in Him. That He is mercy and love. more than any of us can ever understand as humans. Feel good and believe, and try to make each day better than the last by comming closer to God and understanding His mercy and love for us through the sacrafice of His only Son who loves us more than we can imagine.That is why He died the way He did. You might want to check this website, it looks like that the pillars in your picture look similar to that of the Saint Peter's in Chains church. To me it looks as though Our Lord is exerting His Mercy. I remember it being said that even when we don't seem to acknowledge Jesus' Mercy, He will still make every effort to make It available to us. Hmm.... interesting because the rest of the picture is very dark and gray, while Jesus is very bright and heavenly looking. I have started a blog at http://eucharist-emc2.blogspot.com/ and will be focusing on Eucharist-Light events in the hope of getting people to see the light in the LIGHT. On the day of my revertion, April 16, 1998 I was exposed to both the light of the Crucifix and the Divine Mercy Chaplet. A permanent deacon, was the bearer of the light reflecting crucifix and my wife-to-be, Jen, was the sweet voice that introduced me to the grace of the red and white rays of light. It's a powerful story. Since that day I have been a lay member of the Society of Our Lady of the Most Holy Trinty, SOLT. Last summer at age 79, Deacon Joe Hromadka was ordained Fr. Joe here in Corpus Christi. I am sorry there are not many comments for your blog, I hope that changes soon. My son 14 years old and daughter 7 years old noticed in this image of light our Blessed Mother you can see a crown right at the base of the light of Jesus heart. I had a similiar experience of my own. I was praying the Divine Mercy chaplet before my crucifix one day, asking Jesus to bind all people in my family, etc., to the indulgences of Divine Mercy, and the rays of "red and white" appeared on the crucifix as I continued to pray. The image was exactly as depicted in the "Hyla" Divine Mercy image. It stayed for several minutes, until I was finished. Probably the first public Mass in Rome after Pope John Paul's death was celebrated at 11p.m. in Chiesa di Santo Spirito in Sassia near St. Peter's. There above the tabernacle hangs a Divine Mercy painting and on the left is a stature of Sister Faustina and also a reliquary. The Pope dedicated this painting 10 years before his death. Interestingly he often visited her grave during the war when working in the Solvay factory nearby . Cool picture. Why are we so foolish that NOTHING will convert the hardenened hearts!! I am so sad that so many people instantly dismiss the supernatural. It appears to me like fire emitting from the picture. We all know how the Divine Mercy picture looks like; with rays not fire like it came out in your picture. God is surely speaking to us in many ways these days but we are not listening including me. God have mercy on us and on the whole world! thanks for sharing this pic of the Divine Mercy with us, its awesome!I wish everyone would turn to the mercy of Jesus and repent, what a fabulous world this would be. Our Precious Lord is trying to reach every person that He possibly can, in every way possible, so they will be the receivers of His Mercy through faith and love. He Himself said that He comes now as the God of Mercy...but soon He will come as the God of Justice...He want us all to be the recipients of Mercy..not Justice. Oh! How very much He loves us all. Thank you for sharing this, I pray that it will touch some hearts and souls. DIVINE MERCY SUNDAY, APRIL 23RD (the Sunday after Easter). On February 22, 1931, a young Polish nun, Sister Faustina Kowalska saw a vision of Jesus with rays of mercy streaming from the area of His Heart. He told her to have an image painted to represent this vision and to sign it Jesus, I trust in You! Calling her the Apostle and Secretary of His mercy, He ordered her to begin writing a diary so that others would learn to trust in Him. In a series of revelations, He taught her that His mercy is unlimited and available even to the greatest sinners, and He revealed special ways for people to respond to His mercy. On the Sunday after Easter, April 30, 2000 (Mercy Sunday), Sister Faustina was solemnly canonized in Rome by Pope John Paul II. The Holy Father announced during his homily that henceforth, the Sunday after Easter would be celebrated as Divine Mercy Sunday throughout the universal Church. My daughter, tell the whole world about My inconceivable mercy. I desire that the Feast of Mercy be a refuge and a shelter for all souls, and especially for poor sinners. On that day the very depths of My tender mercy are open. I pour out a whole ocean of graces upon those souls who approach the Fount of My mercy. The soul that will go to confession and receive Holy Communion shall obtain complete forgiveness of sins and punishment. On that day are opened all the divine floodgates through which graces flow. Let no soul fear to draw near to Me, even though its sins be as scarlet. My mercy is so great that no mind, be it of man or angel, will be able to fathom it throughout all eternity. Everything that exists has come from the very depths of My most tender mercy. Every soul in its relation to Me will contemplate My love and mercy throughout eternity. The Feast of Mercy emerged from My very depths of tenderness. It is My desire that it be solemnly celebrated on the first Sunday after Easter. Mankind will not have peace until it turns to the Fount of My mercy. *To venerate a sacred image or statue simply means to perform some act or make some gesture of deep religious respect toward it because of the person whom it represents---in this case, our Most Merciful Savior. Thnak you Michael. Yours is one blog that also has a heart. So often, even in so many Catholic blogs, there appears to be a limit to open hearts. The emphasis is more on the critical, rising more from the head than the heart. There also seems to be a certain pride or fear of being placed in some category of simple believers who might, now and then, make a mistake. Heaven forbid!! Rather, we need more hope like this to show that we are not so self sufficient. When God provides these little means we had better ignore them at our own peril! This image reminds me of the words our Lord spoke to a mystic (perhaps St. Faustina). He said that His Mercy arises from His very nature. If that Mercy is not released, through our help, it is to Him like a very fire, causing Himself to suffer pains of heart. Be at peace for the persecutions shall come and many will reject you for your love of Me, but know that the hour is quickly passing. THE GARMENT THAT IS HOLDING BACK THE RAYS OF MY MOST SACRED HEART WILL BE PULLED BACK AND ALL OF MANKIND WILL SEE MY MERCY IN ITS FULLNESS. I am going through an emotional time personally and pictures like this bring peace to my day. Thank you for sharing. Mercy has a name;the name is JESUS! I AM A REGULAR SITE SEARCHER. I GO INTO SPIRITDAILY AS IT MAKES MY DAY. I CAME UPON THIS PICTURE OF DIVINE MERCY WHICH IS I THINK JESUS ON FIRE FR US TO GIVE US MEANING IN OUR LIVES. DIVINE MERCY CHAPLET IS SAID DAILY BY ME AND MY HUSBAND. I PERSONALLY THINK IT SO BEAUTIFUL THAT GOD LOVES US SO MUCH. THANK YOU FOR THE PICTURE WHICH I WILL TREASURE. I personally have my own experienced this past few weeks since the start of Ash Wednesday. The most related and more emphasis was made on the DIVINE MERCY. What I saw while looking at the image was similar to what this picture looks like that was on top of my bedroom television. Then I also saw the BLOOD AND WATER TURN INTO PURE WHITE WITH A STEM OF RED ROSE. I attribute this vision to the DIVINE MERCY AND ST. THERESE OF THE LITTLE FLOWER OR THE CHILD JESUS. Whether I saw the real thing or just a figment of my imagination, I will never forget it for the rest of my life. This year has been full of miracles for me and I hope and pray that it will continue because I BELIEVE THAT THE LATE HOLY FATHER POPE JOHN PAUL II IS MEANT TO BECOME A SAINT. This is very fitting since his death anniversary or I call it as RESURRECTION will be celebrated this coming APRIL 2ND. IT IS TIME FOR ALL OF US TO PRAY FOR CONVERSION AND PRAY THE LUMINOUS MYSTERY FOR EVERYONE TO SEE THE LIGHT AS WE SEE IT. Don't forget to pray eveyday at 3:00pm. Remember the promises of the feast of divine mercy. You can save every person in the world that is dying or in the process of dying by placing each soul in the Blood in water of Christ. Ask Christ to help you remember this...and every day regardless of where you are.. You will see the clock at 3pm. You will glance at your watch, or computer, or in your car. He has reminded me everyday since I was a young boy. He send someone to wake me up at 3am as well. Ask him and watch what happens... don't ever forget how easy he has made it for all of us to get into heaven. Pray for all your families at 3pm and 3am... he will also grant you favors as well. Nothing is too great for him...don't limit yourself...always ask for the salvation of the world... God has a big mind and can do all things if only we have faith. Shane H.
Don't forget to pray eveyday at 3:00pm. Remember the promises of the feast of divine mercy. You can save every person in the world that is dying or in the process of dying by placing each soul in the Blood and water of Christ. Ask Christ to help you remember this...and every day regardless of where you are.. You will see the clock at 3pm. You will glance at your watch, or computer, or in your car. He has reminded me everyday since I was a young boy. He sends someone to wake me up at 3am as well. Ask him and watch what happens... don't ever forget how easy he has made it for all of us to get into heaven. Pray for all your families at 3pm and 3am... he will also grant you favors as well. Nothing is too great for him...don't limit yourself...always ask for the salvation of the world... God has a big mind and can do all things if only we have faith. Shane H.